When you just can't decide, why not go for the trifecta. 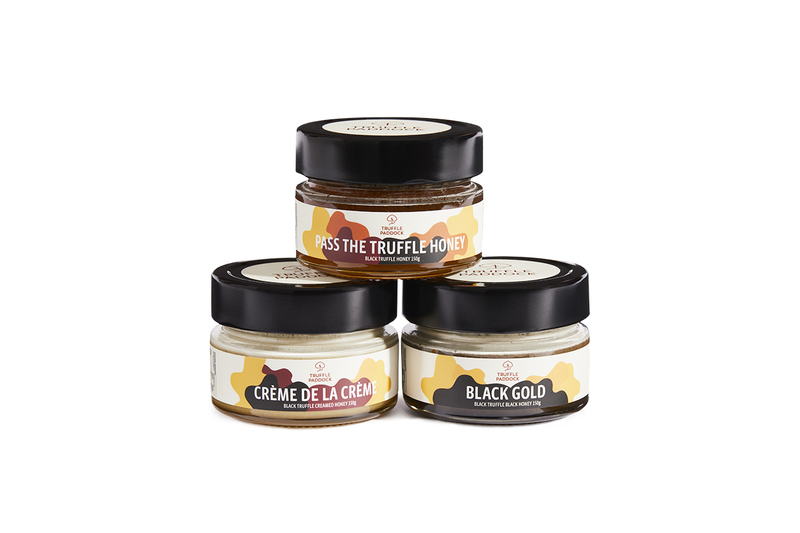 Together with Melbourne's own Rooftop Honey, we have created three superb truffle honeys; Pass The Truffle Honey, a clear Australian honey with Australian black truffle pieces, Crème De La Crème, smooth and creamy Australian honey with Australian black truffle pieces throughout and finally Black Gold, Australian black truffle honey laced with significant quantities of Australian black truffle powder. All our honeys are great in both sweet and savoury applications; dizzled over cheese, basted on a roasting chicken, added to caramelised carrots and onions of simply spread on a hot and steamy crumpet. Of course any truffle product can be a gift but Truffle Melbourne have sourced a few ready to go gift packs and we've put together some of our Truffle Paddock items together to form the perfect gift, whatever the occasion. Next time you're invited to friends or family for dinner, ditch the bottle of wine and give the gift of truffle. You’ll be invited back!